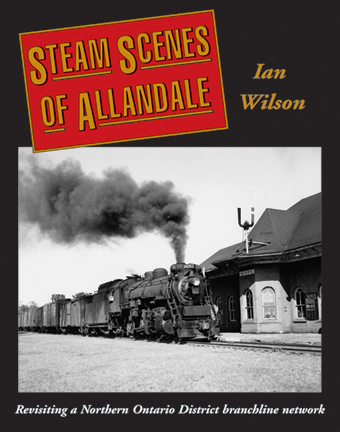 Along with Steam at Allandale, the additional 375 images and 57 maps comprising the new Steam Scenes of Allandale complete the record of a network of CNR lines in the postwar steam era. Stand amid cinder-blanketed shop tracks as locomotives are serviced at the Allandale roundhouse; watch the bustling yard engine switch cars for local assignments; visit the magnificent station platform as passenger trains make connections; witness way freights and mixed trains embarking for the picturesque environs of Collingwood, Meaford, Penetang, Georgetown and Parry Sound; and experience the sadness of dead engines languishing on storage tracks after autumn 1958. Journey to the busy yards at Orillia, Gravenhurst and Huntsville, where North Bay passenger trains and local switchers share the spotlight. See diesel cars pounding along the branchline from Burlington through Palgrave and Beeton, and venture to the wilds of Algonquin Park on the remnants of the old Canada Atlantic Railway. Marvel at a mixture of neat railway stations and grounds in an era when CN Express trucks, mail sacks and milk cans shared platforms with passengers. Behold steam locomotives amid their natural habitat of wooden trestles, 70-foot turntables, crossing shanties, water tanks and timber coaling plants against a backdrop of Ontario's most beautiful scenery in the Niagara Escarpment, Lake Simcoe, Georgian Bay and Muskoka regions.